The British government will withhold aid to Rwanda following allegations that the country has been financing rebels in the Democratic Republic of the Congo (DRC). In a defining moment for UK aid policy to Rwanda, the international development secretary, Justine Greening, announced on Friday that £21m of budget support – money that goes directly to the Kigali government – due to be handed over next month will not now be released. In July, Britain withheld £16m in aid after an interim UN report alleged Rwanda’s involvement in neighbouring DRC, but the money was controversially restored by Greening’s predecessor Andrew Mitchell in September on his last day at DfID. Greening’s decision is perhaps no surprise. Last week, she and the foreign secretary, William Hague, said a subsequent report by the UN expert group (pdf) into the fighting in the DRC provided “credible and compelling” evidence of Rwandan support for the M23 rebels who are fighting government troops. The violence has led to the displacement of almost half a million people in eastern Congo, raising fears of a humanitarian crisis. Rwanda’s president, Paul Kagame, denies the allegations. The EU, US, Germany, the Netherlands and Sweden have already suspended aid to Rwanda. Greening said on Friday that the evidence DfID had gathered “constitutes a breach of the partnership principles set out in the memorandum of understanding [between Britain and Rwanda], and as a result I have decided not to release the next payment of budget support to Rwanda”. The UK international development select committee backed Greening’s decision, but in a report published on Friday it said DfID should consider the alternative channels to deliver its aid and the wider implications for its programmes if unrest in the region continues. The committee also questioned how Mitchell could have concluded in September that Rwanda’s support for the M23 rebels had ended. Britain is Rwanda’s largest bilateral donor, and planned to increase its aid from around £75m in 2012-13 to £90m by 2015. The UK has praised the east African state for making progress on poverty alleviation and meeting the millennium development goals. Human Rights Watch’s UK director, David Mepham, said withholding aid to Rwanda sent an “unequivocal message” to Kigali to stop supporting the “abusive M23 rebels in eastern Congo”. A HRW report in September said the Rwandan army had deployed troops in eastern Congo to support M23’s military operations. The head of the African Development Bank, Donald Kaberuka, this month urged donors to unfreeze aid to Rwanda to avoid causing long-term damage in the country. East African Business Week reported Kaberuka saying the consequences of withholding aid could be costly and take a long time to repair. Rwanda’s Foreign Minister Louise Mushikiwabo expressed disappointment at the UK government’s decision: “False, politically-motivated allegations against Rwanda serve the purposes of those who would rather ignore their responsibilities and not face up to the complex governance and security challenges that have afflicted the DRC over many decades. Blaming Rwanda might suit short term political ends but ultimately it hinders understanding of the conflict and puts an effective and lasting solution further out of reach. DfID will provide a further £18m of support for immediate humanitarian needs in DRC, it announced on Friday. Aid agencies have warned that thousands of people are seeking shelter in camps for internally displaced persons that are already beyond capacity, raising concerns of a cholera outbreak. The DRC country director of Mercy Corps, Mark Dwyer, said: “Thousands of displaced people are in and around Goma now, searching for a safe place for their families. Many have moved from one camp to another and back again across the last week, fleeing the fighting. By Jonathan Miller, Foreign Affairs Correspondent, Channel 4 News. The former private secretary to the Rwandan President has warned that British aid is bankrolling an unaccountable, repressive regime, accused of war crimes in neigbouring Congo and of killing or jailing dissidents at home and abroad. Despite ever-more serious allegations of human rights abuse at home and war-mongering abroad, the UK is planning to give £270-million to Rwanda over the next three years. By then, aid to the country will have nearly doubled since the Conservative-led coalition came to power. Half of that aid will be given directly to the Rwandan government, to spend as it sees fit. Rwanda relies on foreign aid for nearly half its budget and Britain is its biggest bilateral donor, providing about five per cent of the national budget – more than the Rwandan government allocates to defence spending. The international development secretary, Justine Greening, is to decide next month on whether to hand over the next tranche of aid, totalling £21 million. Her predecessor, Andrew Mitchell, suspended payment of a £16 million instalment after evidence first surfaced that Rwanda was backing the violent rebellion in neighbouring Congo. Controversially, Mr Mitchell then unfroze that aid in his last day in the job. In evidence to a parliamentary select committee he claimed to have had Downing Street’s approval. Last week a United Nations report said the Rwandan military was supporting Congolese rebels who took over the eastern city of Goma. Mr Kagame has long been feted for his leading role in ending the Rwandan genocide, during which an estimated 800,000 members of the Tutsi tribe were murdered by ethnic Hutus. and has been held up as a paragon of modernity and reform. But the relationship has been strained in recent months by accusations made by United Nations investigators over Rwanda’s alleged funding and arming of a rebel force in eastern Congo. This group, known as M23 and whose top commander is wanted for war crimes by the International Criminal Court, has forced at least 500,000 people to flee their homes and last Wednesday seized the regional capital, Goma. The following day, the United Nations Security Council published its investigators’ findings, naming the Rwandan Defence Minister, General James Kabarabe – a close friend and associate of the President – as the alleged co-ordinator of rebel military operations inside Congo. Rwandan forces, the UN report claims, not only supplied guns, money and recruits, but has engaged directly in combat to help the rebels capture an expanding swath of territory. The Rwandan government vehemently denies these claims, accusing the UN investigators of seeking to malign Rwanda’s image and dismissing the report as not worth the paper it was written on. President Kagame has joined regional leaders in urging the M23 to pull out of Goma, but has failed to condemn the rebellion. In contrast, the British government says it judges the UN evidence to be “credible and compelling”. The promotion of regional peace and security as well as respect for human rights and democratic principles are built into the agreement which governs the aid relationship between Britain and Rwanda. Foreign policy officials claim British aid buys political leverage. Despite repeated requests, British aid officials in Rwanda were unable to provide specific examples of projects funded by British aid. Nor were they given permission to discuss them on the record. Requests for an interview with Miss Greening were declined. Britain maintains that it considers the overall “direction of travel” when it looks at Rwanda’s performance on human rights. But there has been no public criticism of widely reported abuses, which have included the jailing of all three opposition party leaders, the decapitation of a deputy opposition leader, the shooting dead of a journalist, and the imprisonment of others. The repression intensified in the run-up to the presidential election in August 2010. David Himbara claims to have been the victim of attempted abduction by Rwandan agents and has been warned by intelligence officials in South Africa, where he now lives, that he is on a Rwandan government hit list. There have been at least seven assassinations or attempted assassinations of Rwandan dissident abroad since 2010. The former army Chief of Staff, narrowly survived assassination in South Africa last year. Mr Mugenzi, who stood as a Liberal Democrat candidate in a local election in London last year, had challenged President Kagame’s human rights record live on air in a BBC World Service radio phone-in. Although an alleged assassin was apparently intercepted and refused entry to the UK, he believes the threat is still active. President Kagame appears to have taken a high stakes gamble. While the accusations against his country are serious, Rwanda will, from January, have a seat on the UN Security Council, which will boost its diplomatic clout and reduce the chances of it facing international isolation. *Jonathan Miller is Foreign Affairs Correspondent for Channel 4 News. His Dispatches investigation into Rwanda, “Where Has Your Aid Money Gone?” will be broadcast on Monday Nov 26 at 8pm. 24 Nov, 2012 – Former Rwandan soldiers tell David Blair of their time fighting a war across the border, inside the Democratic Republic of Congo. Their accounts contradict Rwanda’s repeated denials of any role in Congo’s conflict. The orders given by the Rwandan general were clear and stirring. “Now the time has come when you must fight for your country,” he told a gathering of soldiers at the national military academy. But this new campaign would not be waged on Rwanda’s territory. Instead, this specially formed battalion of the Rwandan Defence Forces was about to be dispatched over the north-western frontier and into the Democratic Republic of Congo, where it would inflame one of the world’s bloodiest civil wars by fighting alongside a brutal rebel movement, led by an indicted war criminal. A former NCO with this Rwandan unit has given The Daily Telegraph a detailed account of how he fought in support of M23 insurgents in eastern Congo between July and September, joining assaults on two towns and a border crossing. Another Rwandan separately told how he was detained by his country’s army in June and sent to Congo, where he served as a battlefield porter. He was based in a military camp run jointly by M23 rebels and Rwanda’s army. Together, their accounts contradict Rwanda’s repeated denials of any role in Congo’s conflict. They provide independent confirmation of a United Nations report that has accused Rwanda of helping M23’s campaign. They will also raise questions over why Britain is the only European country still giving aid directly to President Paul Kagame’s government in Rwanda. By sending troops to fight alongside M23, Rwanda stands accused by critics of escalating a devastating war and helping to force at least 500,000 civilians from their homes. It would also have broken UN Resolution 1897, which bans any country from giving military “assistance, advice or training” to any group in Congo. By helping M23, Rwanda will also have chosen to ally with Bosco Ntaganda, the rebel movement’s titular leader, who has been indicted for alleged war crimes. Furthermore, M23 defied the unanimous will of the UN Security Council and seized the city of Goma on Tuesday. This assault on the biggest urban centre in eastern Congo claimed yet more lives, forced thousands to flee and inflamed the war still further. Britain remains Rwanda’s largest bilateral aid donor, promising the country £75 million this year. Unusually, £37 million of this money will go straight into Mr Kagame’s government coffers as “budgetary support”. Andrew Mitchell, the former international development secretary, delayed a payment of £16 million in July when the UN published its first findings about Rwanda’s role in Congo. But he announced the release of this money on his last day in office in September. Justine Greening, who replaced him in a Government reshuffle, will decide next month whether to hand over the remaining £21 million of British money. All British aid is reserved for education, health, agriculture and development – there is no question of any funds being used for military purposes. Yet by subsidising Rwanda’s government, Britain risks giving Mr Kagame more discretion. He could rely on outside donors, who provide 46 per cent of his national budget, to fund essential services and use his own resources in other ways. Jean-Paul Nsengiyumva (not his real name) served as an NCO with a regular Rwandan infantry battalion until June, when he was transferred to a “special battalion” created to fight in Congo. After being briefed by one of Rwanda’s most senior generals at Gako Military Academy, his unit was sent to back up Congo’s rebels. “At that time, M23 did not have many soldiers, so when the fighting was hard, they were calling us for help. Then we would come over the border and take the town,” he said. “When we finished, we would pull back to Rwanda and allow M23 to occupy the area.” Three times, his unit went over the frontier and into battle at M23’s request, helping to seize the border crossing at Bunagana and two other towns. In September, however, Nsengiyumva’s unit was deployed to bolster an M23 assault on a big Congolese army camp. This battle was tougher than expected – two attacks were beaten off and Rwandan forces with their rebel allies only succeeded at their third attempt. Nsengiyumva, tired and sickened by months of fighting, chose to desert in the confusion that followed. He surrendered to Congo’s army and was jailed in Goma until being released during the chaos that preceded its capture this week. A younger Rwandan with no military experience also found himself drawn into Congo’s war. Nsengimana Ngaruye (not his real name) was detained by Rwandan soldiers inside his home country while returning home from a village market in June. He and three friends were ordered to join a group of soldiers and carry their packs and ammunition. He was then taken to a military base and, in return for payment in food, told to carry the baggage of Rwandan soldiers into Congolese territory. For more than two months, Ngaruye, 24, was based at a military camp inside Congo called Mbuzi. He was taught how to fire a Kalashnikov assault rifle and given a steady diet of indoctrination by Rwandan officers and Congolese rebels. “They used to tell us, ‘Your enemy is the government of Congo, we need you to fight them and once we take over the country, you will get rewarded’.” Ngaruye said the camp was filled with Rwandan soldiers and Congolese rebels, although a colonel in the Rwandan army was in command. He never fought, but carried ammunition and supplies whenever an attack was launched. In September, he deserted. He surrendered to the Congolese army and was also jailed in Goma until being freed last week. Congo’s government accuses Rwanda of wanting to dominate the east in order to loot its mineral wealth. But the armed group responsible for the genocide of Rwanda’s Tutsi minority in 1994 remains at large in Congo’s rainforest, giving Mr Kagami genuine cause to fear for the security of his frontier. Mr Kagame says that “not one bullet” has passed from Rwanda into Congo. The British Government will decide by Dec 15 whether to give him the next tranche of aid. “The Security Council discussed on 21 November the new UN Group of Experts report, which presented evidence of the Government of Rwanda and individuals within Uganda supporting the rebel group M23. All such support is unacceptable, damaging to the security of the region, and in direct contravention of UN Security Council 2076, which demands that any and all outside support to the M23 cease immediately. “We judge the overall body of evidence of Rwandan involvement with M23 in the DRC to be credible and compelling. We will be studying the implications of this report in full, but these allegations will necessarily be a key factor in future aid decisions to the Government of Rwanda. “We note that alleged Ugandan involvement is assessed to be of a lower intensity and less systemic than Rwanda’s. We call on both countries to respond in full to the report’s findings, and to engage openly and constructively with the UN process. “The UK is greatly concerned about the escalating situation in eastern DRC and the plight of its civilian population. We repeat our calls for the immediate withdrawal of the M23 from Goma, the restoration of State authority of the Government of the DRC in Goma and in North-Kivu, and the end to attacks on the civilian population. Source: Foreign and Commonwealth Office. The leader of the Democratic Republic of Congo says he is prepared to study the grievances of rebels who have taken the country’s main eastern city, Goma. Speaking after talks with his Ugandan and Rwandan counterparts, Joseph Kabila also said he would consider negotiating with the rebels from the M23 movement. But the three leaders called on the rebels to stop their offensive “immediately” and leave Goma. Earlier, the rebels threatened to march on the capital, Kinshasa. On Wednesday they advanced on Sake, 27km (17 miles) west of Goma. They were reported to be preparing to head south to Bukavu, the city about 230km (143 miles) south of Goma. The M23 rebel commander told a crowd in a football stadium in Goma that “the journey to liberate [DR] Congo has started”. The BBC’s Gabriel Gatehouse in Goma says it is unclear whether the rebels’ capacity matches their ambitions, but they currently have momentum on their side. The M23 rebel group was formed in April following an army mutiny. The rebels said they were not given army posts promised in a 2009 peace deal. The M23’s gains have raised fears of renewed war in DR Congo, where some five million people died in a conflict from 1997-2003. Meanwhile, the UN released a long-awaited report accusing both Rwanda and Uganda of backing the M23, saying the rebel chain of command culminates with Rwandan Defence Minister James Kabarebe. Both Rwanda and Uganda strongly denied the accusations after the report was leaked last month. UN envoy Roger Meece referred to suspicions of international support for the rebels as he briefed the Security Council on Wednesday. “The M23 forces are well provisioned and well supplied with uniforms and a variety of arms and ammunitions, many of which have clearly not come from existing FARDC [army] stocks,” he was quoted as saying by AFP news agency. He also cited reports of rebel abuses. “We have received numerous reports of targeted summary executions of those who stand in their way, including government and traditional leaders who resist or fail to co-operate,” he said. The rebels entered Goma on Tuesday, skirting round a UN compound as Congolese army forces retreated. France has heavily criticised the failure of the UN force, which has about 19,000 troops, to stop the rebels. On Wednesday the UN defended its actions, saying it had fired hundreds of rockets at the rebels in an effort to block their advance on Goma. Mr Meece also said UN peacekeepers were stretched, and that the number of rebels advancing on Goma had suddenly jumped from 500 to 3,000 ahead of the fall of the city. UN officials have said they wanted to avoid triggering a battle in Goma. 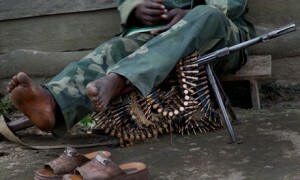 A Congolese military spokesman told the Associated Press that the UN troops lacked a mandate to engage the rebels. The UN Security Council has adopted a resolution condemning the rebel seizure of Goma and calling for sanctions against M23 leaders. The rebellion has displaced some 500,000 people since April. KINSHASA, Nov 17 (Reuters) – U.N. attack helicopters hit rebel positions in eastern Congo on Saturday after insurgents gained ground in heavy fighting with government troops and took control of a town, the United Nations said. The clashes to the south of the town Kibumba mean the rebels have advanced to within 30 km (18 miles) of Goma, the closest they have been to North Kivu’s provincial capital since a rebellion exploded in the eastern provinces eight months ago. North Kivu Governor Julien Paluku said the army retreated to the southern outskirts of the town after M23 rebels – a group of soldiers who mutinied in April – advanced with support from neighbouring Rwanda. A Congolese government statement said 4,000 Rwandans had crossed the border, although Kinshasa later reduced that estimate to 3,500. Rwanda rejected the accusations, the latest in a string of charges by the Congolese government in Kinshasa. The Rwandan government called on Congo’s army and the rebels to halt the fighting as shells were landing in its territory. The French U.N. mission in New York called an emergency closed-door meeting of the Security Council on the escalating violence. “I do hope that we will get a signal from the council telling the M23 to stop its advance and … to call on all the countries concerned to enter into a real negotiation,” French Ambassador Gerard Araud told reporters before the meeting. “There won’t be any solution without an agreement between the DRC and its neighbors, including Rwanda,” he said. More than 5 million people are estimated to have died from violence, hunger and disease in wars in Congo since 1998, which would make it the deadliest conflict since World War Two. The United Nations has about 6,700 MONUSCO forces in North Kivu, with about 1,400 troops in Goma and the surrounding area. U.N. experts have said in reports they have evidence that Rwanda has supported the M23 rebels in eastern Congo. They have called on the Security Council to impose sanctions on Rwandan officials in response. “The Rwandan army came across the border behind our troops, that’s why our troops withdrew,” Paluku told Reuters by telephone. “The (rebels) are just a few kilometres away, so of course Goma is under threat, we can’t hide that,” he said, adding that government troops were regrouping at Kilimanyoka, 12 km (7 miles) north of the city. Rebels said they had no immediate plans to attack Goma. The U.N. peacekeeping mission in Congo said army units had come under heavy weapons fire since early on Saturday morning, forcing civilians to flee. U.N. attack helicopters were dispatched to strike rebel positions south of Kibumba. “So far ten missions have been carried out by our attack helicopters,” the U.N. said in a statement. The U.N. has a mandate to protect civilians and support government troops when they need it. No casualty figures have been given by any force. Rwanda’s army has repeatedly sent soldiers into Congo during nearly two decades of conflict in Africa’s Great Lakes region, but Kigali has strongly denied Congolese and U.N. accusations of support for the M23. “These are absolutely false allegations. They are very tired, and very old. Whenever DRC (the Democratic Republic of Congo) is defeated on the battlefield, it’s meant to be (Rwanda’s army),” Rwandan army spokesman Brigadier General Joseph Nzabamwita told Reuters. “Rwanda has called on (Congo’s army) and M23 to stop this useless war … Rwanda is being violated by constant bomb shells on our territory,” he added. More than three-quarters of a million people have fled their homes since the fighting began, and regional efforts to find a solution have so far failed. M23 spokesman Vianney Kazarama told Reuters the rebels were now in control of Kibumba, but said they would not advance further. Rebels advancing in the eastern Democratic Republic of Congo are warning UN peacekeepers that “we will respond” if they fail to stop backing the regular army by strafing rebel positions. 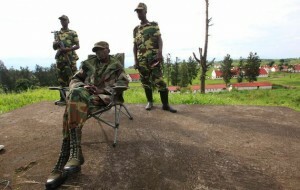 Brigadier General Sultani Makenga (seated) of the newly formed Congolese Revolutionary speaks to the media in Rumangabo military camp, Democratic Republic of Congo. UN attack helicopters launched sorties against M23 rebels on Saturday but failed to prevent them from taking another town, as the Security Council demanded an end to foreign support for rebels closing in on the provincial capital of Goma. Kinshasa meanwhile made fresh accusations against its eastern neighbour Rwanda, saying it was backing the rebel forces. A United Nations peacekeeping spokesman said the M23 rebels had taken the town of Kibumba. It lies just 25 kilometres (15 miles) north of Goma, the provincial capital of the strife-torn North Kivu province, which borders Rwanda and Uganda. The M23 has “never attacked” MONUSCO camps in Kitale and Kiwandja –areas currently under rebel control — but the rebels cannot “tolerate (MONUSCO’s use) of helicopters (and) tanks against the people,” he said. In New York on Saturday, the 15-nation Security Council went into an emergency session on the crisis. With M23 rebels less than 20 kilometres (12 miles) from Goma, the main city in the mineral-rich region, UN leader Ban Ki-moon appealed to Rwanda’s President Paul Kagame to “use his influence on M23,” said UN peacekeeping chief Herve Ladsous. It vowed new sanctions against M23 leaders and those who help it breach UN sanctions and an arms embargo. The latest fighting has forced more than 7,000 people to flee to the already packed Kanyarucinya displaced persons’ camp, some 10 kilometres outside Goma. And fears were growing that the rebels might try to take Goma itself. Saturday’s fighting was just the latest clash this week between the army and the rebels of the M23 group, composed of ethnic Tutsi army mutineers. While each side blamed the other for the latest violence, MONUSCO said the M23 had launched an offensive with heavy weapons early Saturday. As a result, the UN mission had deployed its peacekeepers to protect civilians. “As part of this, 10 missions were carried out by (MONUSCO) attack helicopters,” it said in a statement. The attack helicopters, provided by Ukraine, were put on standby Friday after the M23 attacked the army just north of Goma. MONUSCO said the latest fighting was taking place about five kilometres from the Kanyarucinya camp, which currently holds between 60,000 and 80,000 displaced people. The UN peacekeeping spokesman said government forces and MONUSCO peacekeepers “are attempting to hold off a possible M23 advance toward Goma at Kibati,” about 20 kilometres to the north. “As of right now, UN staff in Goma are gathering at security assembly points to ensure their protection,” he said, adding that UN forces in the city and its airport are on “high alert”. The clashes are the most serious in the rebellion since July, when UN attack helicopters were last put into action against the M23. UN experts have said Rwanda and Uganda back the rebels, a charge fiercely denied by both countries. As the fighting flared, the DR Congo government and army levelled fresh accusations Saturday that the M23 were getting help from Rwanda. DR Congo government spokesman Lambert Mende said the latest fighting erupted when 4,000 men in columns had descended on DR Congo territory from Rwanda. Olivier Hamuli, a DR Congo army spokesman in North Kivu province, said he visited the front line and saw the M23 was clearly receiving support from Rwanda. The M23 rebels are former fighters in the Tutsi rebel group the National Congress for the Defence of the People (CNDP). The CNDP was integrated into the DR Congo military under a 2009 peace deal, but the mutineers say they rebelled because the terms of the deal were never fully implemented. Here is part of Kagame’s address to the Oxbridge Club in Nigeria, relating to Gacaca and Girinka. A PR tour to lure foreigners into believing that these schemes are a success! He knows that very few will read the numerous reports pointing to the contrary. In the last two decades, Africa has begun to move again and entered a new phase. We are no longer looking to the outside for solutions to internal issues because home-grown ideas provide the answer, not only for development but also for the restoration of our dignity. That means change because the status quo has proved unsatisfactory. The collected, accumulated wisdom resulting from both culture andparticipation has the effect of making people shareholders in the enterprise that is their country. As you all know, shareholders want and expect good dividends. This is the source of home-grown ideas. They emanate from what the people collectively know and practice, and their power to drive change comes from this fact. Of course, those who have always treated us as followers rather than leaders in our own right will want to halt the development of such home-grown ideas. Some will do so out of sheer ignorance. More often than not, however, they will disrupt us with subversive intent. But this cannot deter us because as we all know, success built on internally-generated ideas breeds confidence and fosters dignity. Let me illustrate with the practical experience of Rwanda. In Rwanda we have consciously drawn from our history and culture ideas to drive our social, political and economic development for the simple reason that they work. In the aftermath of the genocide in 1994, Rwanda was faced with a huge problem. Considering the large number of perpetrators, the need to give victims justice as well as restore social harmony, conventional political and justice systems were totally inadequate for the task. So we opted for Gacaca, a traditional conflict resolution mechanism, which in a decade tried close to two million cases at a cost of less than one billion US dollars compared to only sixty cases tried by the International Criminal Tribunal for Rwanda costing about two billion dollars. But the significance of Gacaca goes beyond numbers of cases and their cost. Because it was the first home-grown solution successfully applied to a seemingly intractable problem, it inspired and empowered Rwandans to seek and use similar initiatives for broader national development. Its success catalysed the generation of ideas and values crucial to national development – resilience, self-reliance, confidence and social cohesion. Most important, it restored Rwandans’ dignity and pride in our cultural values as a source of remedies to current challenges, innovation and approaches to development. Similarly, the Government of Rwanda initiated the Girinka (one cow per poor household) programme adapted from the traditional Rwandan solidarity practice of giving each other a cow as a pact of friendship and support in the event of misfortune or dire need. In its modern application, Girinka addresses several issues at once – improved nutrition, income generation and increased agricultural productivity. This initiative, together with other poverty-reduction measures, has contributed to the reduction of poverty by 12%, from 56.9% to 44.9% between 2005 and 2010 and raised one million people or 10% of the population out of poverty. Paul Kagame fails to mention that most Rwandans and informed analysts consider those schemes as as a failure. Over 390 local leaders attended a hotel conference at Kibeho in Nyaruguru district, Southern Rwanda, as Southern Province Governor, Alphonse Munyantwali, on Friday made a one-day work visit to the district to assess the current pace towards achieving the 2012-2013 performance contracts. The local leaders ranged from heads of umudugudu (literally village) – Rwanda’s smallest administrative unit – to executive secretaries of cells and sectors plus officials at the district level. “Competence and commitment are key to achieving your performance contracts”, Governor Munyantwali told a keen, interactive audience of local leaders. One of the local leaders in attendance is Peter Iyakaremye, head of Agatare village in Ngarurira cell of Munini sector, Nyaruguru district. “This meeting is a testimony that the top leadership of our province cares for all the leaders even those like me at the very lowest administrative level. That gives me motivation and I feel more and more part of the team”, said Iyakaremye, speaking at the sidelines of the meeting. Areas of Nyaruguru district’s performance contracts include agriculture, roads construction, trade, job creation especially among the youth, assisting vulnerable groups, electricity, clean water supply, grouped habitat and good governance. According to Nyaruguru district’s Mayor, François Habitegeko, the district has already met some of its targets in agriculture where thousands of hectares of maize, Irish potatoes, beans, cassava and wheat are being grown. 83 per cent of Nyaruguru district’s estimated 286,000 population now live in a grouped habitat, according to Mayor Habitegeko, which the district hopes will help bring success in other areas like electricity and clean water supply. And nearly eight months to the deadline of the 2012-2013 performance contracts, Governor Munyantwali sounds upbeat with regard to Nyaruguru district. “It [the current state of performance contracts] gives me a good impression. Almost all the performance contracts are on [the right] track”, said Governor Munyantwali. The Governor further promised to help the district overcome what seems to be its biggest challenge for the moment: a plot of land upon which to build a cross-border trade complex. Last fall, in the 2011-2012 performance contracts’ results, Nyaruguru came in the 26th position out of Rwanda’s 30 districts, scoring an average mark of slightly over 80 per cent. This was a relatively better stance than in the year before, 2010-2011, when the district ranked 29th countrywide with an average point of 75 per cent. In the same 2011-2012 year of performance contracts, the Southern Province is reported to have emerged the first of Rwanda’s four provinces plus Kigali City. And with the Governor’s Friday visit to Nyaruguru district, which ranked the last of the southern province’s eight districts in the 2011-2012 performance contracts’ results, it seems the province is interested in assisting even the apparently less performing districts to help maintain its grip on the first place even this year around. Rwanda’s President Paul Kagame initiated the performance contracts in 2006, as a way of swifting the country’s development through acknowledging and rewarding best performing leaders, among others. 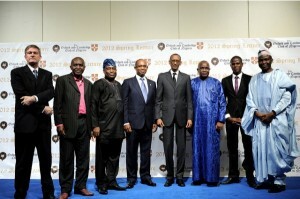 President Paul Kagame ended a two- day tour of Nigeria with a speech as the guest speaker at the annual Spring Lecture held by the Oxbridge Club. The Oxbridge Club is a grouping of alumni of Oxford and Cambridge universities. Kagame is the first incumbent President to address the Club. The President was in Nigeria for a two-day visit on Friday. Below is the President’s speech in full. I would like to thank you for inviting me to join you tonight – this is my first visit to Lagos – and I am pleased it is to be part of this distinguished gathering to share thoughts on how Africa can be more relevant in today’s world. Let me make two points at the very outset. First, Africa today has the opportunity to play its rightful role in the global arena. But to do so requires the continent to speak with one voice and to be competitive in all aspects, which in turn demands radical socio-economic transformation. Second, as the subject of our discussion this evening suggests, Africa will do this when its people lead dignified lives and take full charge of their development agenda. For this to happen, African countries need a new kind of leadership – one that has a vision for the country and a passion and commitment for its rapid development as well as the well-being of its people. The transformational leadership that will lead to Africa’s prosperity and ensure its relevance must be one that is confident, assertive and innovative, and committed to promoting and defending the continent’s interests. Above all, it should be prepared to seek solutions from within the philosophies and practices of our societies to various challenges that we face, and develop ideas to propel our countries forward. Sometimes, this might require going beyond the conventional and embracing the unorthodox. It should be clear, however, that no individual leader or country acting alone will achieve a continent-wide qualitative change and play a significant global role. That can only come about if our leadership seek and promote cooperation across Africa on a wide range of issues. The fact that we are speaking about the need for change and the sort of agents who can bring it about is admission that Africa has not lived up to expectations and its full potential. The question, then, is: What do we need to do to reverse this situation? In the words of an eminent Nigerian, “we must first find out when the rain started beating us”. Africa is not where it should be, not because of a lack of resources or human capital. Indeed if anyone had any doubts about the intellectual and entrepreneurial potential of the continent, they need only to look at those present in this room. As for enterprise, there are fewer greater than Nigerians. The issue has been that we still do not have enough leaders across a variety of fields with ideas to change our societies, the capacity to mobilise our people, and vision and drive to spur innovation and competitiveness. Of course, Africa has had leaders – some of them great – over the last fifty years of independence. But despite the liberation and post-independence ideals, visions were only partially realised and Africa lost decades in terms of much needed development. To be fair, Africa’s shortcomings cannot be entirely attributed to its leaders. Other factors, such as inherited colonial structures that were not always relevant and external control of the development processes, contributed to the situation. What works internally may have application to intra-African situations, particularly as we focus on greater cooperation and integration, trade and investment in order to keep up with the emerging and the traditional strong economies. This is what will guarantee the individual and collective strength of our countries and contribute to our relevance. To take one example from East Africa, as a result of the economic integration of the five member states of the East African Community, the region’s total trade with the rest of the world more than doubled between 2005 and 2010, rising from 17.5 billion dollars to 37 billion dollars. Foreign Direct Investments also rose from 683 million dollars in 2005 to 1.7 billion dollars in 2011. This approach of greater cooperation also extends to peace and stability, and that is why today, African leaders are investing in continent-generated solutions to issues of political stability and conflict resolution. The results so far are encouraging. Somalia is re-emerging as a viable country. Sudan and South Sudan are on the road to peaceful co-existence. In the Democratic Republic of Congo, regional efforts hold the greatest promise of an enduring resolution to the conflict there. In conclusion, I submit to you that Africa’s position and relevance in the world in an increasingly competitive global environment will be ensured by a leadership and people that refuse to be second best and that stand up for their shared interests. This requires a mindset focused on dignity – individually and collectively – and on our culture and history as inspiration and source of solutions to our development needs. And for Africa to have a bigger voice in world affairs, it is imperative that the momentum the continent has gained is maintained and even fast-tracked. That duty falls on those in charge of our countries today, but more so to those who will pick up the baton from them. They have no other option.